posted by Billie Owens in news, business, Sleep Insights, batavia. Sleep Insights, a local sleep medicine practice, is now offering testing at their Batavia sleep center. The sleep center provides board-certified sleep physician appointments (ages 5+), home sleep apnea testing, overnight/daytime sleep testing and CPAP services. They are the only sleep medicine practice in Batavia and the surrounding area to comprehensively offer all these services all at one location. Sleep Insights is neither owned by nor affiliated with a hospital system. In January, Sleep Insights moved into 47A Batavia City Centre and has been remodeling ever since: new interior paint, exterior lit signs, and the creative use of space for patient appointments and sleep testing offers a welcoming environment. The bedrooms resemble upscale hotel rooms with cable TV, WiFi, and sinks. A small snack and beverage area is available, as is curbside parking for testing patients. “We want people to feel relaxed and comfortable at our practice, particularly our overnight/daytime testing patients,” said Dr. Jacob Dominik, Sleep Insights’ medical director. In addition, Dr. Kenneth Murray, a board-certified sleep specialist and neurologist, joined Sleep Insights and began seeing patients at the Batavia location in response to patient demand. People go to a sleep specialist when they aren’t regularly waking up and feeling refreshed or when they suspect they have a sleep disorder, such as obstructive sleep apnea, shift work disorder, insomnia or parasomnias such as sleep walking, nightmares or sleep paralysis. Many patients are referred by their healthcare provider or dentist, but patients can self-refer to Sleep Insights for a physician appointment. Their new location provides a soothing, upscale environment with expanded room for CPAP supplies and support from a Registered Respiratory Therapist. Their phone number is 585.219.4330. New patient appointments are available and no healthcare provider referral is needed. Founded in 2005, Sleep Insights is a regional, comprehensive sleep medicine practice offering consultative, diagnostic testing and sleep therapy services. Sleep Insights is an independent sleep center, not owned by or affiliated with a hospital. The company’s main site is in Rochester, with 10 locations throughout Central and Western New York. posted by Virginia Kropf in bergen, day care, news, business. A Bergen daycare has stepped up to offer services to children whose daycare closed unexpectedly. 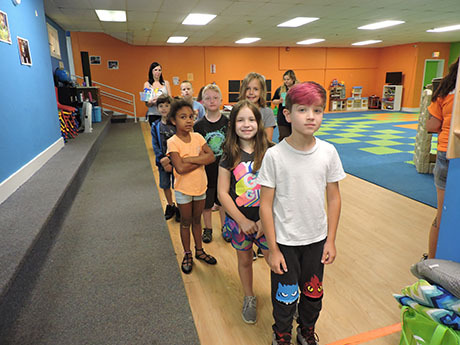 When Amy Hathaway, owner of Little Guppies Daycare, heard that Grandma’s Luv’n Care on Clinton Street Road in Batavia was closing Aug. 31, she contacted the owner and asked what she could do. Hathaway said she believed Grandma’s Luv’n Care was forced to close because of the increased minimum wage. Hathaway has owned her own daycare center for seven years. Her mom ran a daycare out of her home, so she is no stranger to the business, although Hathaway went to college for accounting. She worked at Paychex but realized teaching kids was more fun and started taking care of six children at her house. She next advanced to group daycare, which allows 12 children in one home. “Once I had a waiting list, I knew I had to get bigger,” Hathaway said. 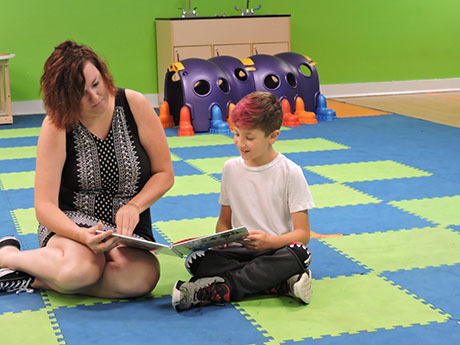 When space in Arlington Manor, the former school in Bergen, came up for lease on Craigslist three years ago, Hathaway contacted the owner and signed a lease agreement, putting a daycare on the ground floor. Hathaway hired Morgan Piccini, of Hamlin, as a schoolteacher, and last year made her assistant director. “I love it here and can’t imagine doing anything else,” Piccini said. As part of Hathaway’s desire to give back to her community, the daycare is planning more activities for the community this year. They will have breakfast with Santa, an Easter egg hunt and a lot of outside events for families. 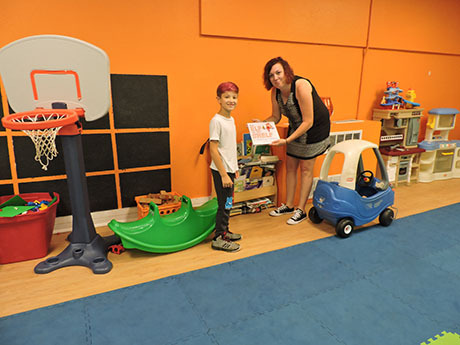 Hathaway has made some long-lasting friends since she has been in the business, such as 9-year-old Cameron Tomai, who has been coming to her daycare since he was in preschool. Another child has been coming since the age of 3 months. Little Guppies Daycare offers breakfast, a morning snack, lunch and an afternoon snack. Hours are from 6:30 a.m. to 6 p.m. Monday through Friday. They accept school-age children 5 to 12; preschoolers 3 to 5 years; toddlers 18 months to 3 years; and infants 6 weeks to 18 months. Top photo: Children line up to go outside and play during a morning break at Little Guppies Daycare in Bergen. Cameron Tomai, 9, chooses a book to read to Amy Hathaway, owner of Little Guppies Daycare in Bergen. Amy Hathaway takes time to listen to Cameron Tomai, 9, read a book. Cameron has been coming to Hathaway’s Little Guppies Daycare since he was in preschool. posted by Howard B. Owens in Empire Access, news, business. A truck struck and sheared off a pole at the interconnection point of two fiber networks providing service to our customers in the Western New York area. The damage to the fiber-optic cables is extensive, but crews are on site and will restore services as quickly as possible. posted by Billie Owens in news, business, batavia, YMCA. This is Charitie Bruning, the new childcare director at the YMCA in Batavia. 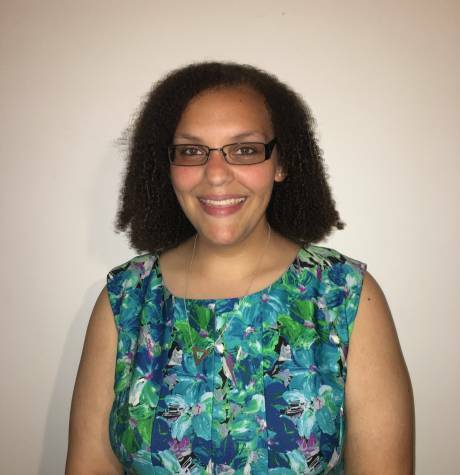 She has nine years of experience working at the Y, including: camp counselor/teen advisor at the Lockport YMCA; youth and teen director at West Suburban YMCA, and teen and family director at Southtowns YWCA. Her Y duties at times overlapped, and she has also served as a staff member for preschool programs, children's activities, and child supervision, and once before spent two years as a childcare director. Bruning has an associate degree in Liberal Arts and Sciences with a concentration in Education, and a Bachelor of Science degree from Springfield College in Youth Development with a concentration in YMCA Professional Studies. "My favorite thing about the YMCA has always been about helping families grow," Bruning said. "I love being able to provide programs that help families go from where they are the first day that they walk in the door, to where they want to be. "We see families develop skills and grow closer to each other and form communities within our walls and beyond." When she's not at work, she likes to walk her dog, a Yorkie named Gizmo. Bruning also likes to paint, play the ukulele and be involved in community theater. A quote that resonates with her is: “You have brains in your head. You have feet in your shoes. You can steer yourself in any direction you choose.” -- Dr. Seuss, "Oh, The Places You’ll Go!" posted by Howard B. Owens in Chapin International, news, business, steve hawley. 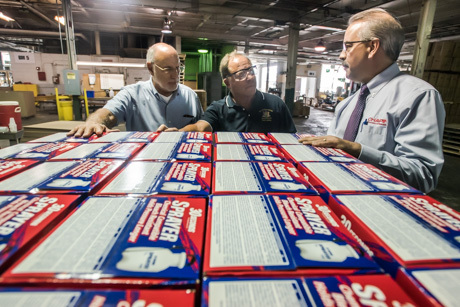 Assemblyman Michael Benedetto, a Democrat from the Bronx, joined Assemblyman Steve Hawley on a tour of Hawley's 139th District, which included a stop late in the afternoon yesterday at Chapin Manufacturing International Inc, in Batavia. The tour started in Lyndonville and included a couple of farms in the area, continued through Medina, and then stopped at LandPro Equipment in Oakfield, Genesee Community College, and then Chapin before a visit to Batavia Downs Gamiong & Hotel before dinner at Alex's Place. Hawley has been conducting these tours for Downstate colleagues now for a few years and they are reciprocal. Hawley will visit Benedetto's district. It's a chance, Hawley said, for representatives from two halves of the state to get to know the whole state better and the unique issues faced in different parts of the state. At Chapin, Benedetto was given a presentation on the company by CEO Jim Campbell before a tour of the factory. Chapin employees 300 people at its U.S. locations, which now includes a plant in Ohio. It makes sprayers and spreaders, primarily, but also has a line of bird feed made in Michigan. Campbell described its bird feed as tasty and nutritious to help birds in the Northeast store energy to make it through winter. One of the biggest challenges for the company right now is finding qualified workers, Campbell said. "If you want a job in our area today, you can work, absolutely," Campbell said. The tight labor market is requiring Chapin to change its approach to recruiting employees. "We used to use the temp-to-permanent model but the people you have out there in temps today are not the people you’re after," Campbell said. "The people you’re after are now working for somebody else. They’re not going to leave a full-time job without a good opportunity to work for us." Benedetto said he often hears on the floor of the Assembly that New York is not a business-friendly state. He asked Campbell if that was his experience in dealing with New York. Campbell said if his company were to look at building a 100,000-square-foot addition to its facility it would cost in New York $7 million. "I can build it in Ohio for $1 million," Campbell said. "It's a huge difference." Campbell's other concern is the skyrocketing costs of New York's workers' compensation insurance, which is now the highest in the United States. 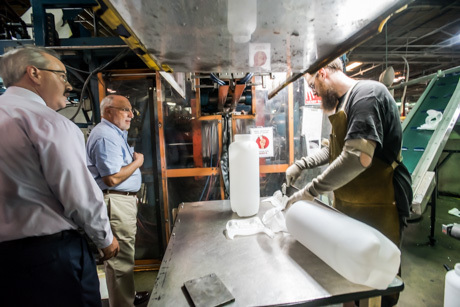 In photos below, William Kegler, director of operations, is conducting the tour. posted by Howard B. Owens in batavia's original, Pontillo's, batavia, business, news. Thirty years ago, Kathy Ferrara walked into Pontillo's thinking she was just taking a job to help her get through college at GCC. Today she is the owner of the successor to Pontillo's, Batavia's Original. On Wednesday, she celebrated that 30th anniversary with friends, customers and employees. "I loved it from day one," Ferrara said. "I look back and I wouldn’t have changed any of it. It was a great environment. I made lots of friends through customers, employees, hundreds of friendships." Now, she says, she's just doing what she was taught by the Pontillos to do -- take care of employees and serve the community. "I have pride and it’s humbling, both at the same time — to carry on the tradition of hiring students, college students and high school students, and watching them come through and seeing them make friendships here, just like I had when I was starting out." posted by Billie Owens in business, maple industry, agriculture, news. U.S. Senate Minority Leader Charles E. Schumer and U.S. Senator Kirsten Gillibrand today announced that they secured a $1 million increase in funding for the Acer Access and Development Program, for a total of $4 million in funding, in the just-passed Senate minibus Fiscal Year 2019 spending bill. Schumer and Gillibrand explained that the Acer Access and Development Program provides opportunities for investment and research for maple syrup, helping producers across Upstate New York increase their production, strengthen conservation and drive efficiency in maple sugaring. Maple sugaring provides income to an estimated 10,000 maple producers spread across the country, and the senators said that the increase in funding will allow U.S. producers to better compete in the global marketplace with countries like Canada, which are responsible for 85 percent of the world’s maple product. The senators said they worked tirelessly for this funding to tap into New York’s burgeoning maple industry, and vowed to shepherd it through Congress and onto the president’s desk. “This critical funding will bring a much-deserved boost to New York’s maple syrup producers, helping them tap into the state’s massive potential,” Senator Schumer said. “The increase in federal funds would be used to help Upstate producers increase their production, strengthen conservation, drive efficiency in maple sugaring, and increase global competitiveness. “New York is one of the leading maple-producing states in the nation, and these federal funds will help our state’s maple industry grow even more,” said Senator Gillibrand, a member of the Senate Agriculture Committee. “Our Upstate maple producers are working tirelessly to increase production and expand to new markets, and I was proud to fight for this funding that will allow the Acer Program to provide this critical support. Maple syrup is an important agricultural product across 10 states in the Northeast and Upper Midwest. According to the USDA, in 2017, the United States produced more than 4.27 million gallons of syrup, worth approximately $147 million. Maple is also a critical conservation crop, which helps to keep our forests in production, conserves important lands, protects water quality, and provides a valuable economic benefit to rural communities. The maple industry has seen significant growth in recent years. New York State ranks second in the nation for maple production, behind Vermont, with 806,000 gallons of maple syrup produced in 2018, according to New York State. Schumer and Gillibrand have long fought on behalf of Upstate New York’s maple producers. Schumer’s legislation, the Maple Tapping Access Program, which later became the Acer Access and Development Program, was signed into law as part of the 2014 Farm Bill. Earlier this year, Schumer and Gillibrand worked to include language reauthorizing the Acer program as part of the 2018 Senate Farm Bill, and vowed to continue to fight to ensure that this provision is included in the final version of the Farm Bill. posted by Howard B. Owens in Batavia Nursing Home, batavia, business. Batavia Health Care Center, a 62-bed skilled nursing facility in Batavia that provides rehabilitation and nursing services to patients who require short- or long-term nursing care following hospitalization, has been purchased by The Grand Healthcare System. The Queens-based company, which has a track record of improving underperforming nursing homes through strong leadership, training and capital improvements, renovations and equipment upgrades, purchased the facility for an undisclosed amount. Batavia Health Care Center, which is located at 257 State St., will be renamed The Grand Rehabilitation and Nursing at Batavia and will become one of numerous nursing homes across the state affiliated with The Grand Healthcare System. Other properties are located in Syracuse, Utica, Albany, Columbia, Delaware, Dutchess, Ilion, Madison, Oneida and Otsego counties, as well as the borough of Queens. The facility has a staff of more than 200 employees. posted by Howard B. Owens in Foxprowl, business, batavia, news. 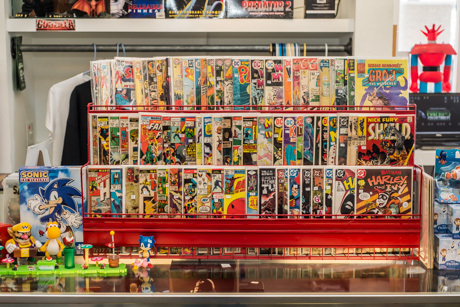 The collectibles store Foxprowl is back at its original location, 440 Ellicott St., Batavia, after a couple of years of trying a location at Main and Jackson and pop-up stores and online sales. After a barbershop that had moved into the location closed, owners Bill and Joy Hume saw it as an opportunity to get back to their roots. "It’s a familiar spot," Bill Hume said. "I like the building and the location and I like the landlord so it was kind of obvious. It worked out good. It just happened to become available and I jumped on it. My gut instinct told me, go back home." Added bonus, his stock of T-shirts with the 440 Ellicott St. address on them is back in style. 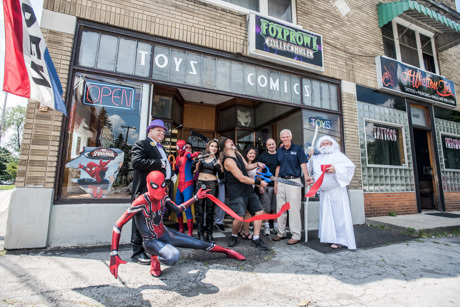 Yesterday, the Chamber of Commerce was on hand for a ribbon cutting with help from Batman's Penguin, Wolverine, Spider-Man & Velma from Scooby-Doo, all from WNY Superheroes and Cosplayers. The grand-reopening yesterday also included appearances by Brenden Gillard, artist, voice actor, costume designer, and author. Anthony Zicari, comic writer and editor, was also on hand. Bill Hume said he will bring in more celebrity guests and he's also looking to bring back Foxprowl Con, perhaps in the coming year, with some new ideas. posted by Billie Owens in Le Roy, business, news, Farmer's Creekside Tavern & Inn. The almost 200-year-old Farmer’s Creekside Tavern & Inn has been fully restored and expanded after a fire nearly destroyed the building in 2004. At just over one year in business, Farmer’s is making waves -- not only received the OpenTable Diners' Choice Award, but also recently being awarded the Wine Spectator Award of Excellence. Establishments awarded, “The Award of Excellence” typically offer at least 90 selections, feature a well-chosen assortment of quality producers, along with a thematic match to the menu in both price and style. Whether compact or extensive, focused or diverse, these lists deliver sufficient choice to satisfy discerning wine lovers. The world of wine is vast and nearly limitless. There are more than 25,000 different grape varietals grown in more than 6,000 regions. Politics, trade and agricultural economics have largely influenced what grapes dominate the market. Today, the average consumer is generally exposed to the “6 Noble Grapes” which include: Cabernet Sauvignon, Merlot, Pinot Noir, Chardonnay, Sauvignon Blanc and Riesling. While Farmer’s Creekside pays homage to many of the “popular kids,” we’ve dedicated ourselves toward exploring many of the other 24,994 grapes from several of the lesser-known regions. Humans are explorers at heart and we hope to lead our guests through an exploration of wine. With a modern menus, beautifully appointed guest rooms, and an award-winning wine list, Farmer’s Creekside Tavern & Inn has positioned themselves as a destination dining venue worth visiting. It is located at 1 Main St. in the Village of Le Roy. For more information visit FarmersCreekside.com or call to reserve a table 585-768-6007.
posted by Howard B. Owens in solar farms, batavia, business, GCEDC. The Genesee County Economic Development Center (GCEDC) voted to approve incentives for the construction of two 2MW community solar farms for a combined total of 4MW at 2901 Pearl Street Road. The developer, Pearl Solar LLC will invest approximately $6 million investment and will receive incentives of approximately $472,000 in sales and property tax exemptions. “While we were concerned about the fact that the project will only create one job, there are other temporary economic impacts such as construction and installation jobs as well as benefits to the local community in approving a renewable energy project of this nature,” said GCEDC Board Chairman Paul Battaglia. Among the benefits of the project include: an enhanced property tax payment through a 15-year PILOT (Payment In Lieu Of Taxes) resulting in approximately $311,000 in property tax payments to Genesee County and the Pembroke school district; energy discounts of 10 percent for local residents who sign an agreement with the company to purchase solar energy from the project(s); and, a community benefit agreement in which Pearl Solar will make a $50,000 donation to the Genesee County STEM2 STAMP workforce development program when the two projects are completed. posted by Billie Owens in business, news, Camp Hard Hat, construction trades, education, GC Park & Forect. Twenty-two students entering eighth, ninth and 10th grades are leaving their mark this week at Camp Hard Hat at the Genesee County Park & Forest. The Camp Hard Hat Class of 2018 is working as a team, and building raised wooden walkways for the General Conservation Trail at Genesee County Park & Forest. In addition to completing this project for the community, campers use math, process-thinking skills, and battery-powered tools to improve their community while learning about careers in Building Trades. Parents, friends and family of the campers are invited to the dedication of the wooden walkway, which will take place at 2 p.m. on Friday, Aug. 3rd. Camp Hard Hat is presented in partnership with Genesee County Parks, Recreation & Forestry, the Business Education Alliance of Genesee County, the Business Education Council of Wyoming County, and GVEP Batavia Building Trades. Instructors Rich Monroe and Jared Radesi teach campers the principles of design and construction, project safety, and the power of teamwork. All materials, equipment and lunch are provided each day, along with an optional overnight experience at Genesee County Park & Forest and a camp T-shirt. Thank you to our sponsors for making this camp possible! The generosity of sponsors helps cover the cost of materials, instructors, transportation and provides the opportunity for camp scholarships. For more information contact Karyn Winters at [email protected] or call 585-343-7440, ext. 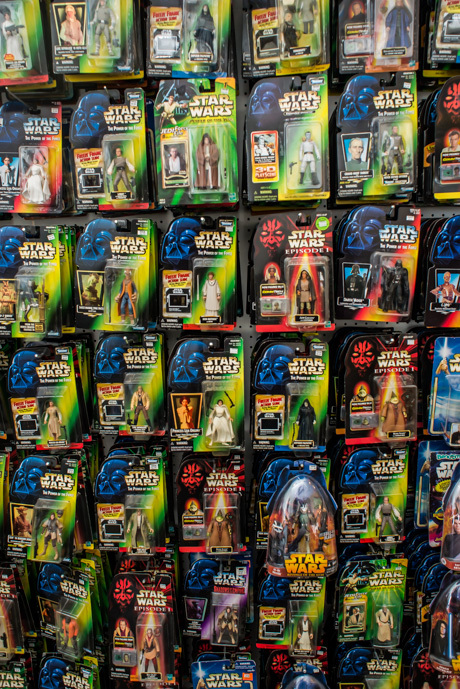 1025.
posted by Billie Owens in foxprowl collectables, business, news, batavia, notify, toys. posted by Howard B. Owens in Cindy and Barb's, Pavilion, business, news. 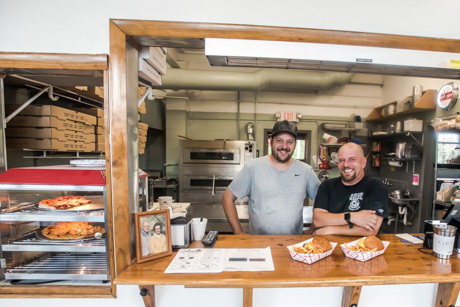 After spending a couple of decades kicking around the kitchens of Batavia, Robert Rudnicki and Adam Horton decided it was time to strike out on their own. They're starting small -- a pizza and sub shop in Texaco Town -- but they have big ambitions. "You have to start somewhere," Rudnicki said. "You start out cooking for someone else, then you go out on your own, and like I say, my ideal thing is I want a full-scale restaurant but this is how you get there." Rudnicki and Horton are partners in Cindy and Barb's at the corner of Route 20 and Route 63 in Pavilion. They picked the location because they like the 14,000 cars that pass through the intersection every day. They also think that part of the county needed another dining option. And, besides, the space -- formerly the Pit Stop -- was available. "I wasn't planning on a pizza and sub shop but that’s what people wanted," Rudnicki said. "I’m giving people what they wanted and trying to do it at a fair price." The restaurant is named after Rudick's and Horton's mothers. Rudnicki, especially, was influenced by his mother to make cooking a career. He started out professionally at Mancuso's, then the Batavia Club. After serving in the military he returned to Batavia and wound up at Sport of Kings. He worked there for 19 years. That's where he met Horton, who worked there 17 years. Before that, Horton had worked at the Candlelight Room, Bohn's, Sunny's, and Settlers. Both Horton and Rudnicki said they really enjoyed working together at Sporto's. After Horton went through cancer treatment and recovered his health, Rudnicki pitched his restaurant idea. Cooking, Horton said, is just what he loves to do. "It’s just a fast pace," Horton said. "It’s actually a rush when you’re on the line getting your butts kicked and things are flying out the window and when you get done with it, you’re like 'wow, we did put out a lot of food.' It’s always been exciting for me." Rudnicki was one of the competitors in the Foodie Challenge, which was awarded two restaurant spots inside of Eli Fish Brewing Company as part of the FreshLAB project. Not winning one of those two top spots didn't deter Rudnicki. He said he was intent on opening his own restaurant one way or the other. For him, he said, a lot of what the program offered was redundant, given his years of experience in the restaurant business, though he did learn a few things that he thinks will help him going forward. "It’s a great program for people just starting out and who want to become entrepreneurs and do their own thing and create their own concepts," Rudnicki said. The menu of Cindy and Barb's right now is standard roadside grill fare: pizza, sandwiches, hamburgers and hot dogs, and they also have an ice cream parlor. "You've got to have ice cream," Horton said. Rudnicki said new menu items will be added as the business grows and he will include daily specials along the way. "In this business, you’ve got to change," Rudnicki said. "The minute you stay stagnate, you’re done." Both Rudnicki and Horton said they are determined to see their new business succeed because they're doing what they love. 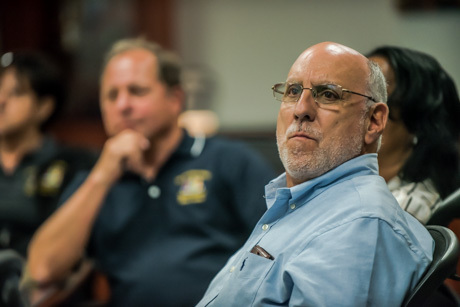 posted by Billie Owens in assemblyman steve hawley, news, business, breweries. Today, Assemblyman Steve Hawley (R,C,I-Batavia) announced that a bill passed earlier this year aimed at helping local breweries, wineries and distilleries attain tax-exempt status when doing various sampling events in New York State (A.11203) will be amended to become congruent with current law. “It is extremely important to our producers, wineries, distilleries and breweries, who host many tasting and sampling events, that employees under the legal drinking age are still allowed to work at these events,” Hawley said. “Furthermore, this legislation provides a great boost to local businesses and tax credits will be available to New York producers who offer tastings on their own premises. posted by Billie Owens in senator charles schumer, upstate dairy farmers, agriculture, business, news, nafta, canadian trade, milk pricing. Last week, U.S. Senate Minority Leader Charles E. Schumer spoke directly to United States Trade Representative Robert Lighthizer to urge him to secure a level playing field with Canadian producers during the renegotiation of the North American Trade Agreement (NAFTA). According to Schumer, in recent years, Canada has established dairy pricing policies and has maintained high tariffs that have effectively created a “Dairy Wall” -- stopping most U.S. dairy products from accessing Canadian markets and distorting global trade. Dairy farmers and producers from across New York State have been severely hurt by Canada’s manipulative and protectionist dairy trade practices, and it will only get worse without action. Schumer, in his call, urged USTR Representative Lighthizer to press forward during NAFTA negotiations to secure free and fair trade for dairy farmers and producers in New York State and beyond. While NAFTA negotiations have stalled and there have been no scheduled NAFTA rounds, new rounds of negotiations are anticipated. “During my call with United States Trade Representative Lighthizer, I made it clear that our hardworking New York dairy farmers and producers across Upstate New York are the most competitive in the world, but they depend on stable and fair rules to compete fairly in the nearby Canadian market," Senator Schumer said. "But Canada has erected a de facto protectionist ‘dairy wall’ and is not playing by the rules, and the current NAFTA renegotiation must be used to rectify that. Schumer explained Canada has an unfair advantage over New York dairy farmers and producers. In addition to Canada’s 270-percent tariff on milk, a program called the “Class 7” pricing program, a market-distorting supply management system, has caused severe pain to New York dairy producers since it came into force last year. In fact, Canada has used the Class 7 program to triple its milk powder exports in the past year, by creating excess milk production capacity within Canada then dumping the resulting milk powder onto world markets. To further prove this dumping exists, Schumer added that Canada’s dairy farmers are some of the highest paid in the world, yet Canadian dairy companies are still able to be among the lowest cost sellers of Class 7 products globally. Schumer made clear in his call that as the United States, Canadian and Mexican trade officials are closing in on a deal to revamp NAFTA, dairy farmers must be protected, and that more must be done to finally dismantle Canada’s market-distorting policies and ensure a level playing field for Upstate New York ’s dairy farmers and producers. Schumer said that he has directly stressed the importance of securing meaningful changes in our dairy trade relationship with Canada to past and current administration officials, including President Trump, current United States Trade Representative Robert Lighthizer, Canadian Ambassador to the United States David MacNaughton, and the U.S. Ambassador to Canada Kelly Craft -- who have all committed to address this issue. Recently, Schumer joined Senator Tammy Baldwin (D-WI) and Speaker Paul Ryan (R-Wisconsin) to urge U.S. trade officials to do more to secure a level playing field with Canadian producers during NAFTA negotiations. posted by Billie Owens in Le Roy, business. 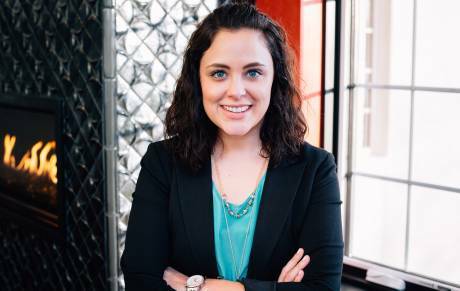 Rochester, N.Y. — Full-service advertising, marketing and public relations agency Dixon Schwabl is pleased to announce the promotion of Merritt Ward to account director. As account director, Ward will lead the IP.com, ESL Federal Credit Union and New York Apple Association accounts. She will be responsible for strategic planning and organic growth for integrated marketing clients. Dixon Schwabl, a full-service marketing communications firm established in 1987, provides marketing, advertising, public relations, social and digital media, research, interactive and media placement services to more than 100 clients nationally. The firm generated nearly $70 million in revenue in 2017. Based in Rochester, Dixon Schwabl has been ranked one of the 25 Best Small & Medium Workplaces in America by the consulting firm Great Place to Work for 13 consecutive years, including No. 1 rankings in 2008 and 2010. In addition, Dixon Schwabl was ranked the No. 1 Marketing Firm to Work for in America by Great Place to Work and Fortune magazine in 2016. The agency was also named one of the 2010 Top 20 Small Company Workplaces in the country by Inc. magazine and Winning Workplaces, as well as one of the Top Places to Work in PR by PR News in 2010, 2012, 2013, 2014, 2015 and 2016. Most recently, the agency ranked No. 22 on Ad Age’s 2015 Best Places to Work in Advertising & Media list and was officially certified as a Minority and Women’s Business Enterprise by New York State in 2016. For more information, visit dixonschwabl.com. posted by Howard B. Owens in GCEDC, batavia, bergen, Le Roy, business. The Genesee County Economic Development Center (GCEDC) approved incentives for two projects at the agency’s July 12th board meeting. The combined projects are anticipated to create 20 new jobs and approximately $7.6 million in capital investment. J. Rental is receiving sales, mortgage and property tax exemptions of approximately $723,000 to build a new 60,000-square-foot facility on 19.5 acres in the Apple Tree Acres business park in Bergen. The $6.3 million project will create 15 new jobs. For every $1 in public benefit, the company is investing $14 into the local economy. Lancor Development Corp. is proposing to invest $1.3 million to build a 12,000-square-foot facility in the new Le Roy Food and Technology Park. The project would create five new jobs and retain seven jobs. Lancor is receiving sales and property tax exemptions of approximately $122,000. For every $1 of public benefit, the company is investing $28.5 into the local economy. The board also accepted an application from Pearl Solar LLC for the construction of two 2MW community solar farms for a combined total of 4MW at 2901 Pearl Street Road. Both projects have the same address but would have separate parcel tax map numbers. Pearl Solar LLC would make an approximate $6 million investment and is seeking approximately $288,000 in sales and property tax exemptions.